NATHAN Fletcher knows youth in Calliope think there is nothing to do but he wants to change their perception. He is heading a group of residents working to establish a youth centre in Calliope. 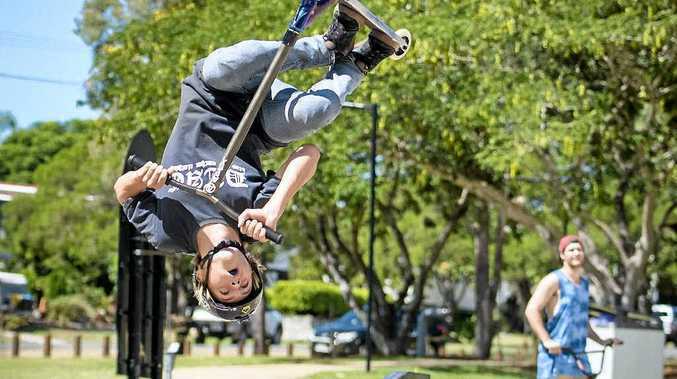 The first fundraiser for the proposed centre was held in conjunction with a competition at the Calliope skate park on Saturday. Mr Fletcher said the idea had been in the pipeline for six months. "There isn't a lot to do for youth in Calliope apart from the skate park," he said. "So we also want to give youth who aren't into the skate scene an interest too. "With the dynamic of families that parents are coming home late from work, it's become apparent that it's needed for that extra support for the youth." Mr Fletcher said the need for a youth service in Calliope had again been highlighted at a recent Calliope Youth Centre committee meeting. "We want to give the Calliope youth skills to become leaders in the future, not only in their lives but also for this region," he said. Mr Fletcher said the group is aiming to establish an all-purpose facility at the Calliope Rodeo Association. "We've been talking about it since the Calliope Carols, just from the response we had from the community and in particular the youth," he said. Those who attended the competition at the skate park on Saturday were asked to complete a survey to determine the interests of different age groups. The Calliope Youth Centre committee will next meet on April 23.